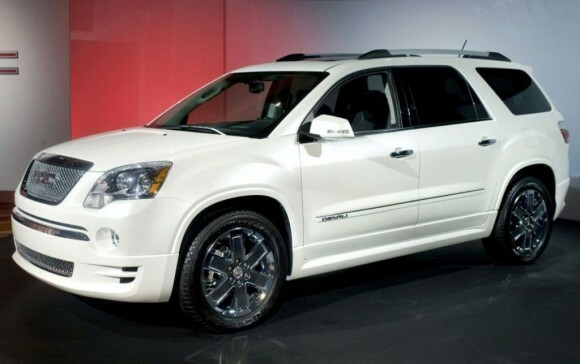 GMC has unveiled the new 2011 Acadia Denali in Detroit. The first Denali was launched in 1999 on the Yukon brand and helped define the luxury SUV segment. With nearly half of all Yukon sales being Denali models, expanding the Denali line to include the Acadia was a logical extension. Acadia Denali will provide GMC customers with all the amenities the Denali is known for in a fuel-efficient crossover. The Acadia Denali is powered by a 3.6L direct injection V-6 engine with VVT that optimizes performance and fuel economy, while also reducing emissions – including a 25-percent reduction in cold-start emissions. Engine performance is enhanced by the advanced six-speed automatic transmission. The maximum towing capacity is a class-leading 5,200 pounds. A long, 118.9-inch wheelbase and wide 67.28-inch front/rear tracks give it a lower center of gravity and enable smooth, stable ride and handling for driving comfort. Independent front and rear suspensions enhance smoothness and deliver a more responsive driving experience. The front suspension features a MacPherson strut design, with a direct-acting stabilizer bar and aluminum knuckles, while the rear suspension uses a compact, state-of-the-art linked “H” design. Isolated mounting points help reduce noise and vibration. The suspension is tuned specifically for the Acadia Denali’s 20-inch wheels and the available AWD system enhances dry-road handling and provides increased traction on wet, snow and ice-covered roads. Four-wheel disc brakes with ABS are standard.